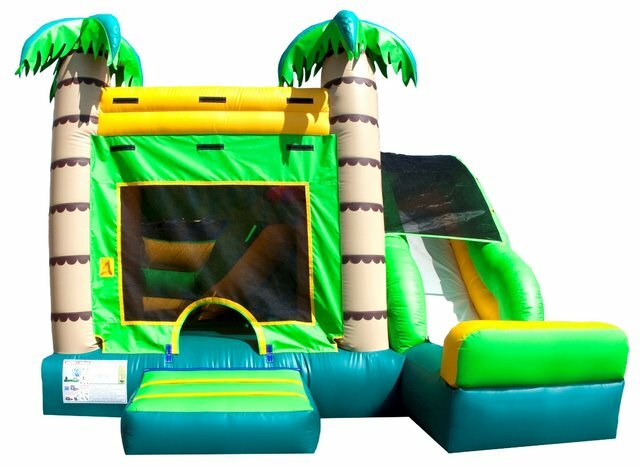 The Tropical 4 in 1 Jumper Slide Combo brings fun by providing a bounce house, basketball hoop, climber, and slide -- all in one unit! This is perfect if you are looking for more than just a bounce house. This jumper slide combo is ideal for any party, corporate and company event, fair, carnival, church event, fundraiser, school event, park event, block party, and any other event. The Tropical 4 in 1 Jumper Slide Combo adds value to any party and keeps the kids entertained for hours! This inflatable has multiple windows, so adults can have a clear view of all the fun. Our moonwalks are made with safe, lead free vinyl.